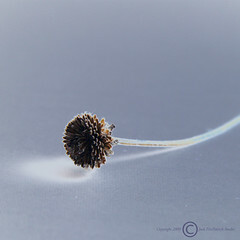 Seed head from a rudbeckia, manipulated in Photoshop. This shot is a reminder to me that my life should not remain frozen, but be fluid - as was my manipulation to the original photograph to get to this image. Oh very cool shot and excellent advice to remember! How's your classes going? beautiful photo and nice thoughts around it too!